Home » News archive » FACE THE LEG…ll. FACE THE LEGACY: Won "Track of the Week" Poll. Face The Legacy is working on their debut album, which has no release date yet. “United As One” is produced, recorded, mixed and mastered by Teemu Liekkala (Red Eleven). The single is released by Roundhouse Music, which is a label by cultural centre Veturitallit Jyväskylä in the city of Jyväskylä. 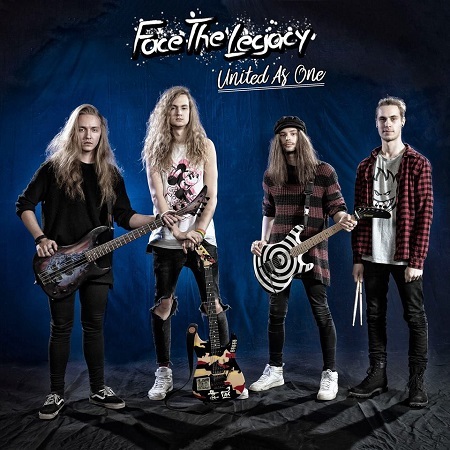 Face The Legacy is part of Jyväskylä Rock Academy, where professionals from music industry help and teach young, aspiring bands in their path. Face The Legacy has had coaching from Mikko Von Hertzen (Von Hertzen Brothers), Noora Louhimo (Battle Beast) and Douglas Blair (W.A.S.P. ), among others. Jyväskylä Rock Academy is based on working model created by Turku Rock Academy.